Despite worldwide outrage over the active dolphin hunt in Taiji, the practice has received little in-depth coverage within Japan. This week, however, the country's leading English-language newspaper, Japan Times, published an editorial piece condemning the Taiji hunt, calling on the government to "defend dolphins, not ‘tradition.'" The op-ed is the first from a Japanese news source to explicitly criticize the hunt, which has evoked vocal opposition from the international community. The Japanese government -- and consequently the Japanese people -- have been put on the defensive regarding the active dolphin hunt in Taiji, and national coverage of drive fishing on the Japanese coast has been limited in scope and depth. According to Kiki Tanaka, a Japanese citizen involved in local protest efforts, Japan has seen a lag in coverage from local outlets, and most reports have focused on the Japanese government's hard line response to global outrage. Few outlets have gone into the ethics or details of the dolphin hunt itself, until now. Many past cultural practices, such as slavery, bordellos and beheading were stopped for ethical reasons. Tradition and culture are forces that change in accordance with new scientific understanding and evolving ethical standards. 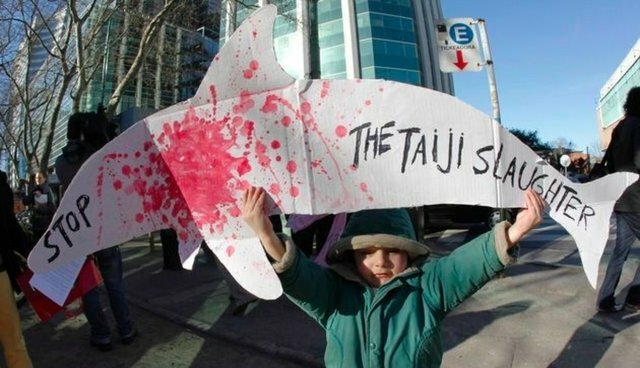 In addition, the Taiji hunt didn't even become institutionalized on a large scale until 1969, so its roots are quite shallow. Additionally, the legal basis for the hunt that officials also keep defending is "equally questionable." Veterinarians and behavioral scientists who viewed the covertly recorded video contend that the killing method used in this year's Taiji dolphin hunt would not be permitted in any slaughterhouse in the developed world... Indeed, it is open to question whether the method would be acceptable if used to slaughter cows or other livestock in Japan. The editorial raises important points that have, up to this point, been left out of Japan's national conversation about Taiji -- which, like internal coverage of the hunt, has appeared to be lacking. Martin Fackler, Tokyo bureau chief for the New York Times, says this could be because of the way journalism is practiced in Japan, as opposed to other parts of the world. "In general, the major new media here do not tend to view something as a story unless the government or some other official actor is responding to it," Fackler said. "In other words, authorities in action constitute a story, but an unaddressed problem does not. So, so long as the Japanese government or some other official group (like the national fisheries co-op) does not take action against the Taiji hunt, it is not newsworthy." Finally, though, that paradigm seems to have shifted. Japan Times's response to the government's inaction in response to the dolphin hunt indicates a positive change, which might also signal a more open dialogue -- and willingness to change perspective -- about the merits of Taiji's "tradition." You can read the rest of the op-ed here. And if you want to join in calling on the Japanese government to put an end to the Taiji hunt, sign our petition to end dolphin slaughter.